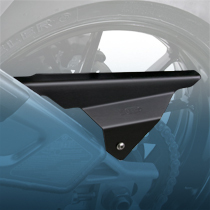 Replace the OEM plastic parts with ZTechnik's ZGuard™ Chain Guard Tire Hugger. Strong, lightweight 5052 aluminum alloy is highly resistant to corrosion. Hard anodizing adds another level of corrosion protection. The ZGuard Chain Guard and Tire Hugger look great when teamed together, and give the rear wheel a seriously powerful appearance. 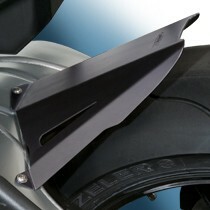 Replace the standard plastic parts on your S1000RR with ZTechnik's ZGuard™ Chain Guard and ZGuard™ Tire Hugger. The ZGuard Chain Guard and Tire Hugger look great when teamed together, giving the rear wheel a seriously powerful appearance. Lightweight 5052 aluminum alloy is highly resistant to corrosion from saltwater and other chemicals. Hard anodizing adds another level of corrosion protection. 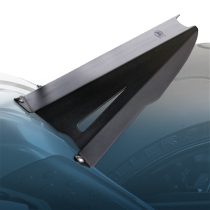 The beautifully machined and formed design makes them strong and rigid.